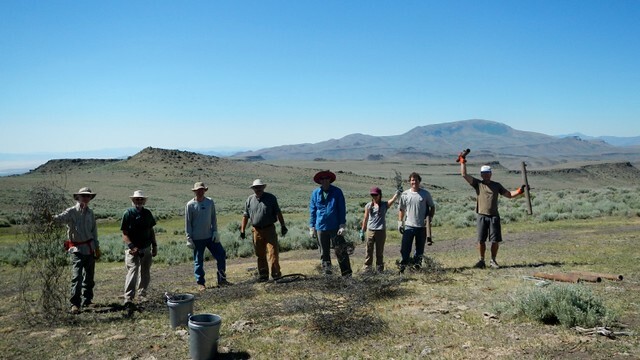 Volunteers cleaned out spent plants, and harvested regional native species to plant around the BLM Black Rock field station. A dump site was cleaned near the ghost town of Sulphur. The scrap metal was recycled as a fundraiser for Friends of Black Rock High Rock. This was a successful cleanup with collaboration between Friends the BLM and Hycroft mine. Friends staff assisted the BLM to open the road through High Rock Canyon, install interpretive signs and replace wilderness boundary signs. Thursday, May 16: Future Generations, Gerlach School Field Trip: Botany and Bees! What a beautiful rainy day for a field trip. The kids were ecstatic to learn about the flora of the desert and their backyard! We identified 18 different species of plants and learned about the honey bee waggle dance. Such a fun day! 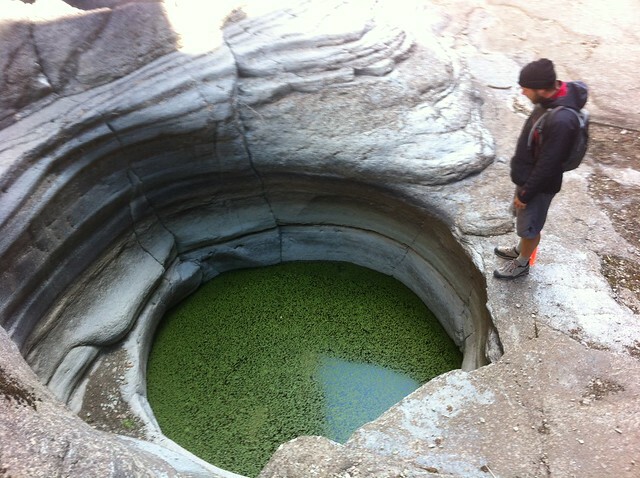 One volunteer was trained to collect citizen science data! Roughly 20 springs were assessed and the new tablet form was tested out for the first time. Volunteers signed up in record numbers to help remove 3/4 mile of fence posts. The fence was installed as part of the BLM Emergency Stabilization and Rehabilitation (ESR) program. The ESR program seeded an area burned by wildfire in 2008 and a fence was installed to protect the area. The fence had hit its 3 year limit and volunteers made quick work of removing it! This was an efficient project with the BLM and Friends of Nevada Wilderness. 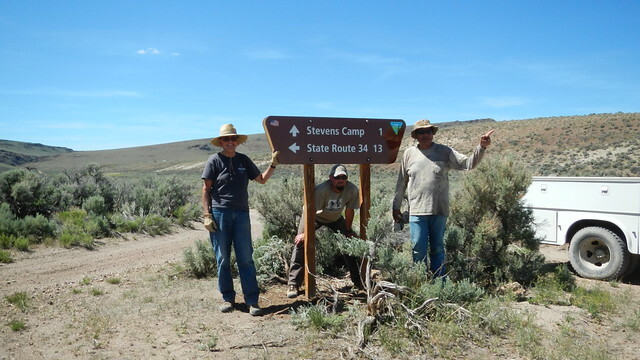 Partners in conservation came together with the Bureau of Land Management (BLM) at Steven’s Camp, north of High Rock Canyon, on June 1st. The main project cleared brush and small boulders from the only designated hiking/equestrian trail in 1.2 million acres of National Conservation Area, adjacent to the historic Applegate Trail. 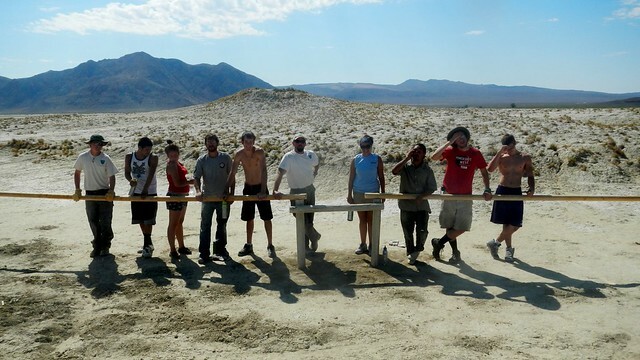 The Friends of Black Rock High Rock team joined volunteers from Back Country Horsemen, Surprise Valley BLM and Friends of Nevada Wilderness to repair five horse corrals, paint the community-use cabin, and replace a window that had been shot out by ne’er-do-wells. Two new directional signs were installed to better identify the remote corner of beautiful scenic history, which is visited year-round by hunters, hikers and horsemen. Friends finished the cleanup of the Rainbow Opal Mine camp sites, riparian areas and vicinity. This was a previous cleanup location for a Black Rock Rendezvous project that was not finished. Mining claim markers, plastic pipes, old camping equipment, steel implements and other trash were removed from this beautiful location along Willow Creek. 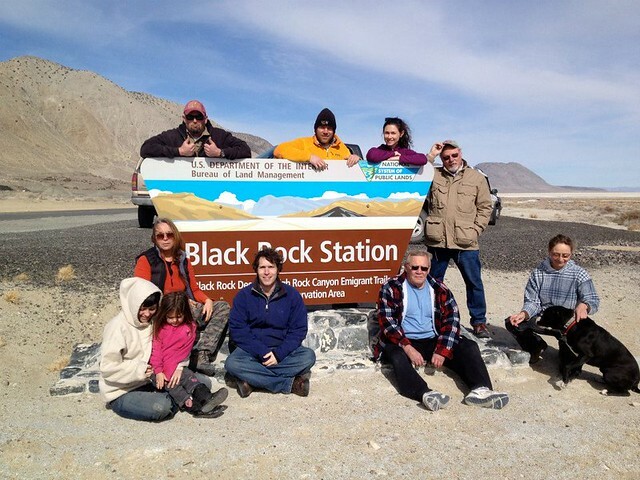 Join us for a weekend of stewardship, opal hunting, spring inventories and overall fun! Delicious meals will be made. 5-10 people needed. 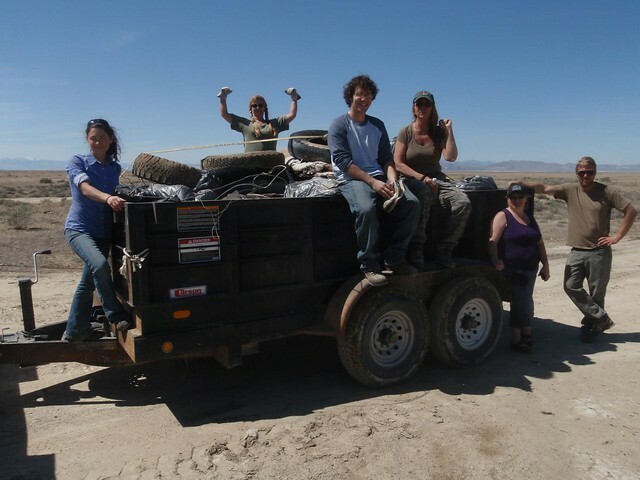 Friends of Black Rock High Rock volunteers and staff removed 6 bags of trash, 60 10-15 foot lengths of pipe, a huge sink, a twisted culvert, 50 feet of barbed wire, chicken wire, and rolls of metal fencing from the beautiful Willow Springs and old Rainbow opal mine area. Mining claim markers (pvc pipes that kill birds) were laid down to remove the threat and springs were monitored!!! A great weekend overall! Thanks to the wonderful volunteers for their hard work in making the desert a cleaner, healthier and safer place for wildlife and people. Friends of Black Rock High Rock volunteers and staff assisted the BLM and Friends of Nevada Wilderness to repair a collapsed exclosure, remove barbed wire and fence and install wilderness boundary signs on the boundary of the North Black Rock Range Wilderness Area. 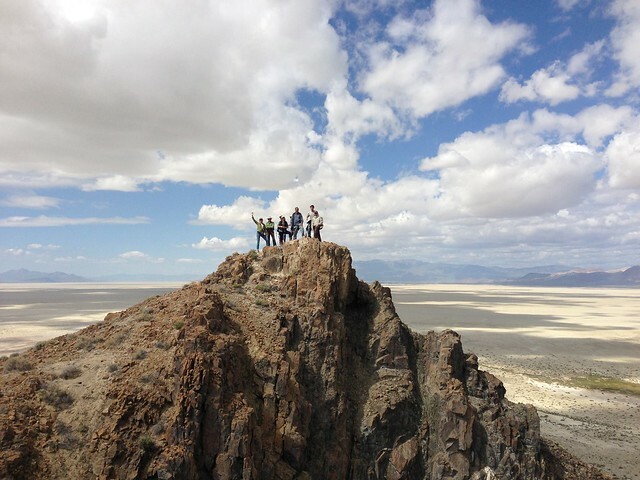 Thanks volunteers, Friends of Nevada Wilderness and the BLM for such a beautiful weekend in the North Black Rock Range!! 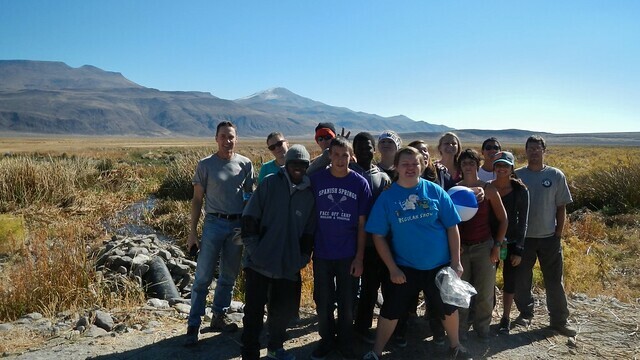 Thanks to Envirolution’s Three Spheres Leadership Academy, the Nevada Outdoor School and the BLM for such a fun camping, conservation and rocketry trip! A section of fence at the Coyote dunes needed some serious repairs after the 4th of July. Such a fun trip!! 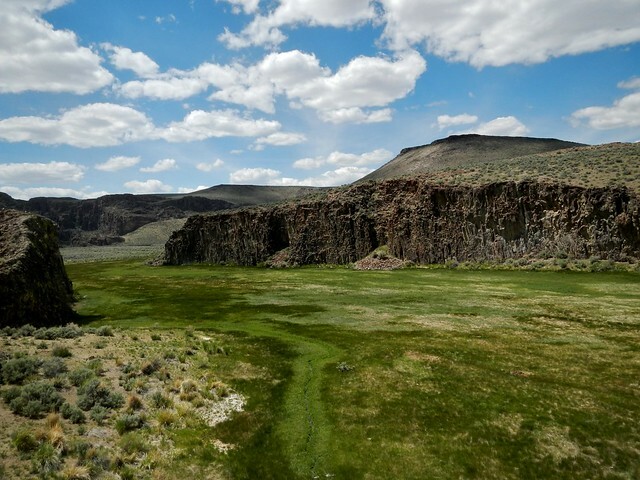 Highway 447 is the gateway scenic drive to all things Black Rock Desert and High Rock Canyon from Reno. It’s a road well traveled and needed some love. 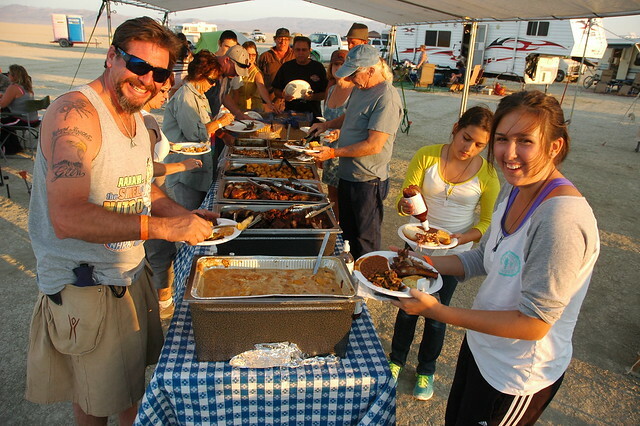 After the trash pickup, Friends of Black Rock provided delicious barbecue at Bevs Miners Club! 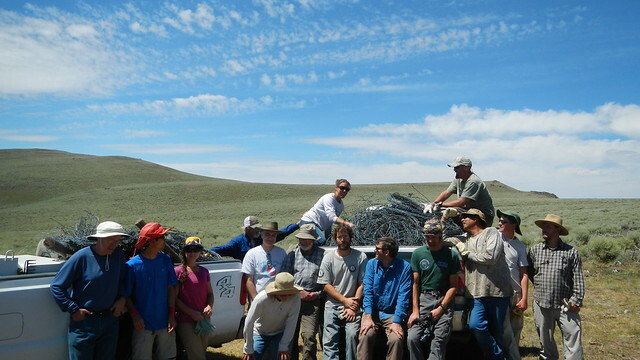 A group of amazing volunteers from Friends of Black Rock High Rock and Friends of Nevada Wilderness assisted the BLM Wilderness Ranger in removing 2,200 pounds of barbed wire and t-posts from an old riparian exclosure in the North Black Rock Range Wilderness Area. A pleasant evening of stars, food, and meteor showers! Three volunteers tested out our new tablet computers to map and inventory noxious weeds in High Rock Canyon. A total of 6 miles of road and riparian area were surveyed. 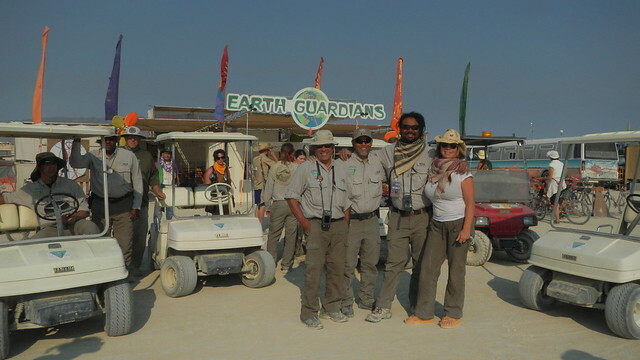 Friends of Black Rock had two projects at Burning Man this year, environmental compliance and BLM interpretive camp outreach. 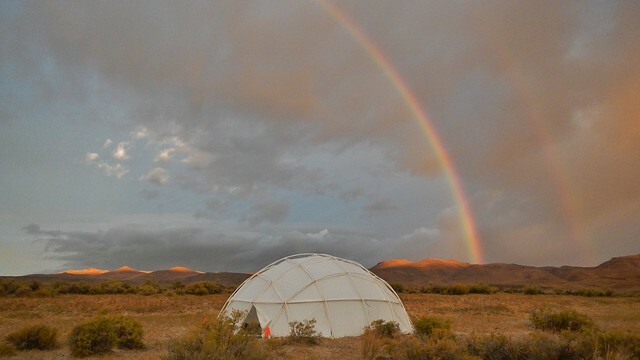 This was the first year of environmental compliance that involved a unique collaboration between Earth Guardians, Friends and the BLM. 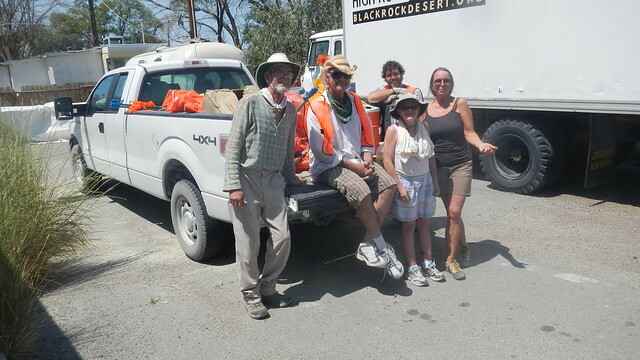 Teams of two (one BLM, one Friends or Earth guardians volunteer) were assigned zones within Black Rock City to survey and use GPS cameras to document oil spills, black or grey water spills, burn scars and trash. In conjunction with the GPS cameras, Friends’ and BLM staff tested two different tablets with unique photo geo-referencing and data collection software. This test will be used to determine more efficient environmental compliance monitoring protocols for the future. 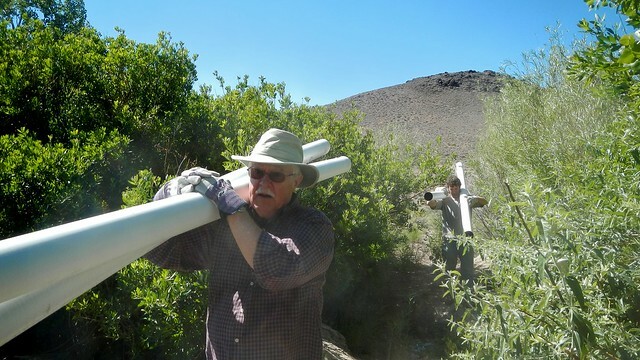 Partner organizations and volunteers restored the Soldier Meadows cabin and campground and improve habitat for the desert dace. Unauthorized vehicle route closures: Installation of metal post barriers to replace broken wooden barriers. Desert Dace vegetation and stream channel maintenance: remove vegetation that is blocking stream flow. Public use cabin maintenance and repairs: repair brickwork inside of cabin, paint, clean up storage area, repair picnic table, pick up trash surrounding cabin. General campground clean-up: redefine campsites and trails using rock barriers. This was the first year of a long term project to restore historical structures at Bitner Ranch. Volunteers were trained to conduct a full archaeological inventory of historical artifacts at this old homestead. Friends partnered with the Envirolution’s Three Spheres Leadership Academy for a 3 day camping and conservation trip. A total of 9 teenagers learned about conservation and Leave No Trace and Tread Lightly camping ethics. 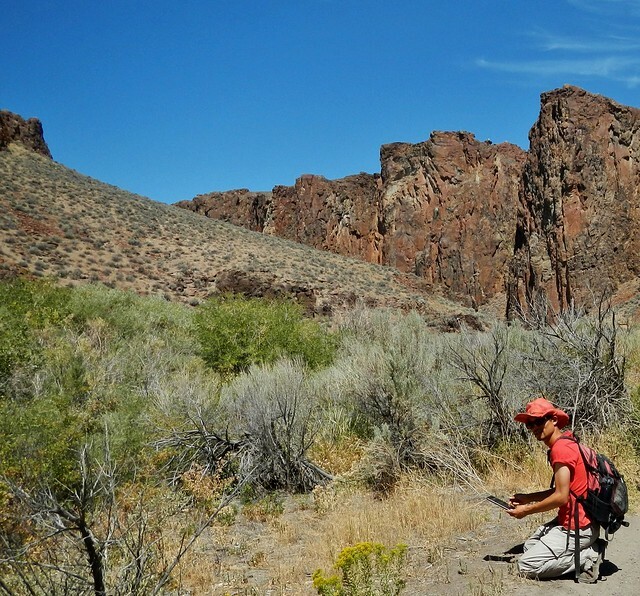 Vegetation was cleared to improve habitat for the desert dace, a federally threatened minnow species. The desert dace is threatened by the predatory green sunfish. If vegetation allow stream channels to overflow into nearby reservoirs, then the green sunfish may be able to invade the desert dace habitat. 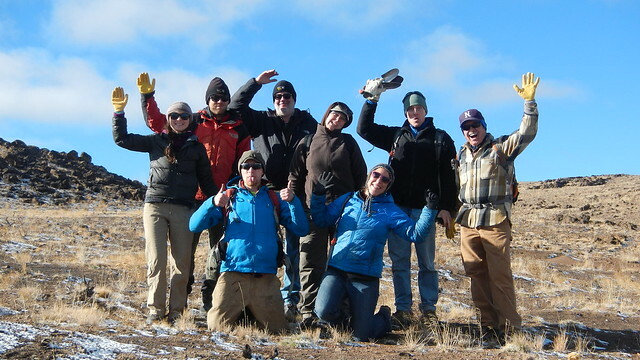 An exceptional group of our volunteers graced the sagebrush sea of Northern Nevada on a snow and blustery November weekend. They came prepared with smiles and a desire to help restore the wildlife habitat devastated during the 2012 Lost Fire. Restore they did! In just two days 8,000 sagebrush and bitterbrush seedlings were planted. These seedlings will jump start the revegetation process in burned over areas, thus restoring habitat for mule deer and sage grouse. Thanks to the BLM and Nevada Department of Wildlife for providing seedlings and tools and thanks to Friends of Nevada Wilderness for being great partners!